https://rising.globalvoices.org/files/2018/12/45876095931_421f7c2aba_o-4... 400w" sizes=" 705px) 100vw, 705px" />Launch of GISWatch 2018 at the IGF in Paris. Image by Arturo Bregaglio. Used with permission from APC. This newsletter is part of the project titled, “Local Access Networks: Can the unconnected connect themselves?” developed by APC in partnership with Internet Society and Rhizomática, with support from Canada's International Development Research Centre (IDRC). It is republished here on Rising Voices as part of a partnership with APC. Click here to see the original post on APC's website. The GSMA launched a new Innovation Fund for Rural Connectivity, aimed at expanding digital inclusion through innovative new technology solutions for connecting unserved rural communities in Uganda and Ghana. Read more. The European Commission (EC) has announced that the date and time for the reopening of the WiFi4EU grant application portal will be 7 November. The reopening of the portal will allow local governments from across the EU to apply for €15,000 grants towards building free Wi-Fi networks. Read more. The ICTD Research Group at the University of Washington’s Allen School of Computer Science and Engineering is seeking qualified students, both from the US and abroad, with an interest in universal internet access and community networking to apply to their PhD programme in computer networking. If interested, please visit the UWCSE admissions page. All students admitted to the Allen School Ph.D programme are guaranteed funding for three years in the form of a research assistantship, teaching assistantship or fellowship. The first re:publica event in Africa will take place in Accra, Ghana on 14-15 December 2018. There will be several sessions on access, and at least two on community networks. Read more. The annual Freedom Online Conference in Berlin is taking place 28-30 November 2018. We can expect to see discussion on the challenges of connectivity, the potential of community networks and platform regulations. Read more. 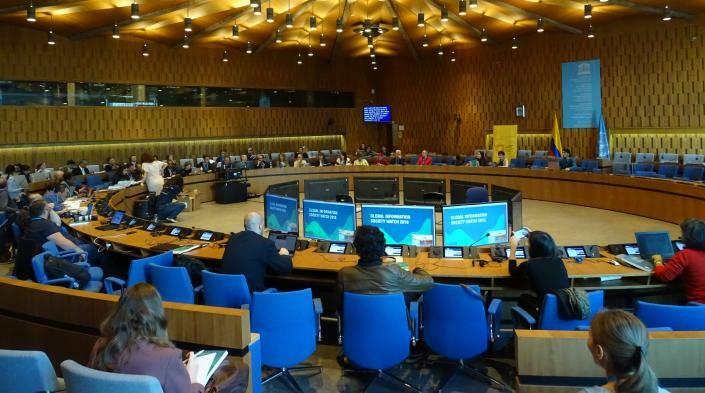 The 13th Internet Governance Forum (IGF) was held in Paris, France on 12-14 November. This year’s conference featured a number of panels on community networks. “Community Connectivity: When the Unconnected Build Connectivity”. Watch the session here and read more here. APC provides its own commentary on the session here. The IGF Dynamic Coalition on Community Connectivity has also published “The community network manual: How to build the internet yourself”, which includes solutions and experiences from community operators and access specialists to guide communities wishing to create their own community network and make it scalable, sustainable and legally based. Download your copy here. “Spectrum for Community Networks: A ‘Must’ That is Hard to Get”. This session included discussion of an upcoming paper “Innovations in Spectrum Management: Enabling community networks and small operators to connect the unconnected”. Download the draft paper here. Watch the session here and read more here. APC also provides a summary of the proceedings here. “Scaling community networks: Exploring blockchain and efficient investment strategies”, a 90-minute roundtable. Read more and view the reference document here. “Connecting and Enabling the Next Billion Phase IV”. Watch hereand read APC’s report on the session here. “Digital Inclusion and Accessibility”. Main session panel focused on leveraging the power of the internet to bring social and economic change to the community. Read more. A roundtable was held by the Dynamic Coalition on Public Access in Libraries: A Policy Toolkit for Public Access. The session included discussion of the draft toolkit to support library action and engagement on the question of public access. Read more. “Innovative Approaches to Connecting Underserved Areas”. Read more and see APC's overview of the session here. “Best Practice Forum on Gender and Access”. Read more and see the minutes from the last virtual meeting held 8 October 2018 here. The annual AfricaCom conference and exhibition took place in Cape Town on 13-15 November, bringing together multiple stakeholders working on various ICT issues including connectivity infrastructure, disruptive technologies, digital services and ICT strategy. Read more. The second edition of Community Network Xchange (CNX) summit took place on 31 October 2018. Organised by DEF India and the Internet Society, #CNX2018 focused on synergies between community networks and community radios across Asia Pacific. Read about it here. An analysis of the Community Networks session at the Africa IGF which was held from 4-6 November in Khartoum, Sudan. Read more. The Mozilla Festival (MozFest) 2018 took place on 22-28 October 2018 in London. With a focus on community networks, the event explored how people in some of the world’s most remote locations are building and running internet connections of their own by featuring a large story display of community networks around the world. Read more. A Community Network Champion programme took place at DEF’s Wireless Training Centre in Guna, Madhya Pradesh from 2-10 November 2018. The workshop, provided to seven community networks from Haiti, Bahrain, Nigeria, Kyrgyzstan, the Philippines, Kenya and Indonesia, offered intensive training on wireless networks, their operations and management. Read more. Wi-Fi World Congress Africa, a two-day conference and exposition on everything Wi-Fi, was held on 27-28 November 2018 in Johannesburg. Read more. The Internet Society has developed a community networks page, which includes resources, recent blogs and articles, information about events and details about community network projects they are launching with partners. Find it here. Highlights include a recent paper, co-published by APC, on community networks in Latin America. [En español] “Redes Comunitarias en América Latina: Desafíos, Regulaciones y Soluciones”. Leer más. 25 October marked the first year since the launch of the Village Base Station Project (VBTS), a community-owned network in Dikapinisan, Philippines. Since gaining connectivity, the coastal community has accessed greater opportunities for development through new income streams and improved efficiency of existing value chains. Check out their progress via their Facebook page here and watch a video about the project here. Nearly 140 people joined the 2018 Indigenous Connectivity Summit in Inuvik, Northwest Territories, Canada for a series of panels and presentations on 9-12 October 2018. The event focused on finding solutions to improve connectivity in rural and remote indigenous communities, with an emphasis on northern connectivity challenges. Read more. netCommons produced a video report during a training session organised in partnership with the Sarantaporo.gr community network for the World Summit on the Information Society (WSIS) Forum 2018 in Geneva. Watch here. [En español] El futuro digital no es de todos. Leer más. Andrew Sullivan, the new Internet Society CEO, speaks about community networks. Watch here from 14:50 to 21:50. Mike O’Reilly of the US Federal Communications Commission claims that community broadband poses “an ominous threat to the First Amendment.” Read more about the controversy here and here. Balquhidder Community Broadband (BCB) named as one of Scotland’s top rural innovators. Read more. Broadband and Bits: a United States-based podcast with weekly interviews focused on community-owned networks and internet policy. Listen here. Closing the ‘digital divide’. Read more. The Pirate Cell Towers of Rural Mexico. Read more. [En español] Capítulo Honduras: “Comunidades Inteligentes” para preservar la memoria. Leer más. [En español] Las redes privadas sin ánimo de lucro como alternativa para cerrar la brecha digital. Leer más. [En español] Buscan fortalecer los procesos de comunicación comunitaria e indígena. Leer más. Rural Americans are rebooting the spirit of the internet. Read more. The “Wish I got that on tape” audio interview series by Kira Allmann covers various topics related to community networks. Listen to the interviews below. The APC interview series “What’s new on the spectrum?” discusses spectrum access and regulation with leading experts working on community connectivity and internet development projects. This article looks at Facebook’s attempt to connect the next billion through Express Wi-Fi, which has been launched in three African countries. Facebook has partnered with the Internet Society, an American non-profit, to improve internet connectivity throughout Africa. Read more. Exploring the possibility of treating NGSO (non-geostationary orbit) allocations as a common pool resource. Read more. Google’s High-Flying Balloons To Provide Internet In Africa. Read more. Submission on proposed policy on licensing unassigned high-demand spectrum and deployment of the WOAN. Read more. Contribution from the Association for Progressive Communications to the IGF intersessional work on Policy Options for Connecting and Enabling the Next Billion(s) – Phase IV. Read more. “Workshop on Community Networks and Reaching the Unserved”. Two-day event, held 24-25 September, organised by East African Communications Organisation in partnership with APC. Read more. Towards affordable broadband access in South Africa: A presentation by A4AI to the Competition Commission of South Africa. Read more. “Global Information Society Watch 2018: Community Networks” was officially launched during the Internet Governance Forum in Paris. This year’s edition focuses primarily on community-owned networks for the provision of physical communications infrastructure. Download your copy here. A full summary of the 13 November book launch at the Internet Governance Forum (with videos) can be found here. [En español] Redes Comunitarias en América Latina: Desafíos, Regulaciones y Soluciones. Leer más. [En español] Marcos regulatorios para las redes comunitarias: Argentina, Brasil, Colombia y México. Leer más. Leal, D. and Wulf, V. (2018). “Going beyond the use of internet in a village in the Amazon region”, Anais Estendidos do Simpósio Brasileiro de Fatores Humanos em Sistemas Computacionais. Read more.